Lagrein is an Italian native red grape variety, grown mostly in Trentino-Alto Adige since ancient times. Lagrien usually makes a monovarietal wine but does also feature in blends. Arguably, Lagrein wines are best from around Bolzano, the capital of the Alto Adige. Indeed, the Benedictine monks of Gries Abbey near Bolzano were famous for it centuries ago. Such was its quality that it was once reserved only for the nobility. As for everyone else, “let them drink Schiava”, just might have been said. On a recent trip judging Italian autochtonous wines in Bolzano, I also went to the Tasting Lagrien exhibition and Cantina Bolzano nearby. For me, these confirmed that Taber Lagrein Riserva is one of Lagrein’s greatest expressions. Consequently, Taber has previously won the Tasting Lagrein competition and is regularly awarded Three Glasses by Gambero Rosso. Bolzano, nestling in the Dolomites, is a spectacular collision of the Alpine and the Mediterranean. The south-facing vineyards of Gries and Santa Maddelena tower above and tumble down on the northern side of the old city. If you’re visiting Bolzano, then a trip to Cantina Bolzano is highly recommended. First, the wine range at this cooperative makes a great introduction to the Alto Adige. Second, their new winery is spectacular, in architecture and location. Last, but hardly least, their Lagrein is the jewel in their crown. Cantina Bolzano (Kellerai Bozen in German) merged two older cooperatives in 2001, namely Gries and Santa Maddalena. Decommissioning their previous facilities, they created a brand new, state-of-the-art winery. Costing €35 million, it became the most significant single investment ever made in the region. Meanwhile, the old facilities became hotel and apartment complexes, helping finance the new building. 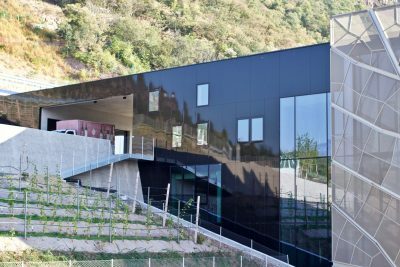 All steel and glass, the winery is excavated into the side of the valley. Consequently, it’s mostly hidden underground, covered by the vineyards. However, what’s on the surface is unashamedly a showpiece. The frontage features a semi-transparent cube, with a pattern representing the veins in a vine leaf. That contains offices, a tasting room and the shop. The gravity-fed and solar-powered winery outcrops behind it. The winery is both practical and attractive. An access ramp leads up to the grape reception at the top. From there the juice passes down through various levels for vinification and finally maturation. Despite there being plenty of activity after the harvest, everything is spotlessly clean. The winery is no dark warren either; natural light descends from the roof atrium through mesh flooring. This mesh can be initially unnerving when looking down upon a vista of fully employed stainless steel tanks. Those wines destined for wood ageing make a final descent to the barrel hall, featuring a mix of barriques and large old oak casks. 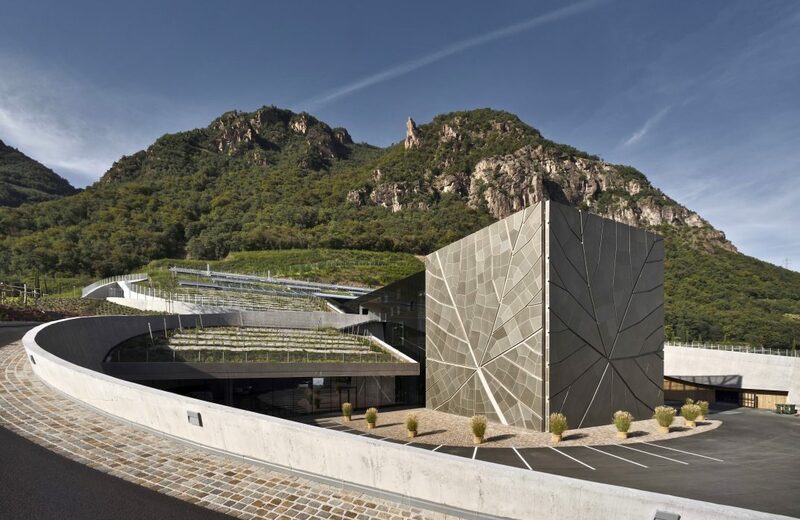 Cantina Bolzano has 224 growers with some 340 hectares of vines, making around three million bottles per year. As is typical with Alto Adige cooperatives, their wine quality is as impressive as that from private producers. They have some of the best Santa Maddelena DOC vineyards for the red Schiava variety. However, they also have 71 hectares of Lagrien vineyards around Gries. This area is Lagrein’s Cru Classico. Led by Klaus Sparer, MD of the Cantina, I sampled excellent Pinot Bianco, Sauvignon Blanc, Pinot Noir, and Schiava as well as Lagrein. There is also a vast range of other wines available. These include Pinot Grigio, Chardonnay, Silvaner, Müller-Thurgau, Kerner, Riesling, Gewürztraminer, Moscato, Merlot and Cabernet Sauvignon / Franc. Perhaps curiously, spumante fizz is the only main wine style missing from their portfolio. However, I was principally there for Lagrein. Cantina Bolzano makes six different varietal bottlings, including a Rosé, in increasing levels of complexity and price. At their pinnacle is Taber Riserva. DNA research indicates that the parents of Lagrein are Teroldego and a still unknown grape variety, possibly now extinct. It’s likely to be related to Pinot Noir and maybe to Schiava and perhaps even Syrah. While always seen as a high-quality variety in this region, historically it was difficult to cultivate well or consistently. Hence until recent times, it didn’t get planted in significant amounts elsewhere. It also loves heat, so Bolzano, which is counterintuitively one of the warmest places in Italy, is ideal. These days, you’ll find it in California and Australia, though I think it might have found its best new home in Marlborough in New Zealand. In modern times, a plethora of clones and biotypes allied to modern vinification means that Lagrein plantings are increasing. The red wines made with it (known as Dunkel) are always deeply coloured, even blackish, and skilful winemaking is needed to tame its astringent tannins into elegance. In the right hands, Lagrein becomes truly world-class; aromatic (rose petals and violets), dark cherry, blackberry and plum fruit, with plenty of fresh acidity and minerality. A brilliant food partner, those with a penchant for Cabernet Sauvignon will find much to delight them. While most Lagrein is enjoyable on release, this a red wine that can improve with age. Taber is 100% Lagrein, full-bodied, dense and powerful. It’s a Riserva, here meaning there is a minimum of 24 months maturation before release. Taber is a spectacular wine in virtually every vintage and benefits from a few years bottle age. 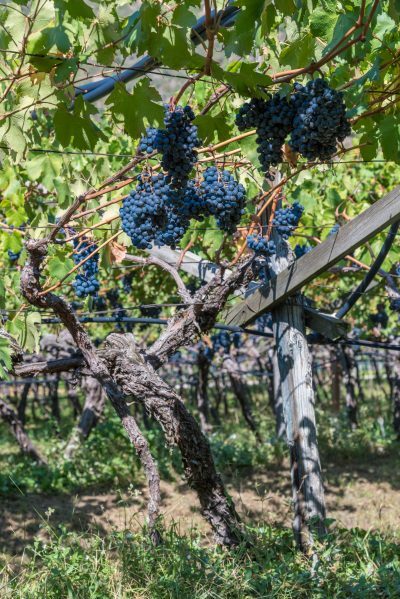 It’s from vines over 80 years old that thrive in the heat of south-facing slopes and sandy soils. After destemming, it ferments slowly at low temperature on the grape skins. It’s then given at least 12 months maturation in French oak Barriques with another 12 months in bottle. Just released. 14% alcohol this year. Inky purple colour. Huge powerful wine, slightly warming, though superb balance with the fresh acidity. Violet aromatics. Dense, ripe damson and plum fruit. Some milk chocolate and vanilla on the finish, showing the barrique influence. Tannins are polished and not intrusive or awkward. Still needs time to knit together. Do not drink yet, ideally needs another 2-5 years. Still inky, just a hint of garnet. Just as powerful as 2016. More harmonious now, very long finish. Cinnamon spice appearing, blackberry alongside the plum fruit. Viscous texture, balanced by bright acidity. Wood influence and tannins seem more in the background, more supportive, less intrusive. Still not ready. A spectacular wine, real bottle development to knit together all the components into harmony. Rose petal, violets and a hint of white pepper on the nose. Still primary plum and blackberry fruit flavours but with a spicy edge. Final traces of chocolate and cinnamon on the finish. Silken texture. Lighter style in this vintage. Garnet coloured. Lighter black and red berry fruits, less alcohol and a silky texture. No overt wood influence. Perhaps a little astringent kick on the finish, but none the worse for that. Smaller, more miniature version, assume that’s the vintage conditions. My favourite in this vertical, just edging out 2013. Still looks young; inky and vivid. No edges or elbows, just an harmonious whole. White pepper again, scents of roses and violets. Primary fruit flavours still dominate, now a hint of developing secondary tones, slightly gamey, a hint of anise. Elegance, balance and length. Possibly at peak now, but many more years of development seem possible. Big wines like a Lagrein Riserva need big food. Roast meats are the obvious choice; anything from Beef through to Venison and Wild Boar will partner up perfectly. Similar thoughts apply to big winter stews. Truffles and chestnuts are great too. Lagrein is a frequent partner with Speck (smoked pork belly). Indeed, the German-influenced local cuisine is a natural for Lagrien. So try knödel (bread dumplings with speck), sausages and kraut. I also like Lagrein with Faggots and peas! For those that prefer to be meat-free, then Mushroom dishes are the obvious choice. Taber Riserva shows how brilliant Lagrein can be and is undoubtedly one of the very best examples made. It’s up there with other Riservas such as Porphyr from Cantina Terlano, Gran Lareyn from Loacker plus Riservas from Muri-Gries and Josephus Mayr Unterganzner. These flagships are not cheap wines, but such excellence never is. However, in a world where “fine wines” command stratospheric prices, Taber and its peers remain a beacon of value. Expect to pay around €35 in Italy. Meanwhile, good Lagrein that’s for younger drinking and a little more wallet-friendly starts at around £15 in the UK. 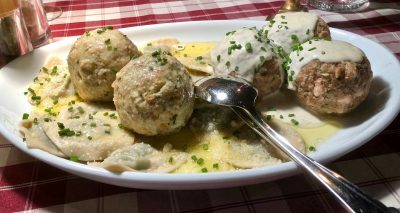 Lagrein is worth discovering; it’s a unique Italian experience! With thanks to Klaus Sparer for the visit and tasting at Cantina Bolzano. Many of the Cantina Bolzano wines are imported into the UK by Mondial Wines. For more wine articles about the Alto Adige, start here.